On Earth Day, consider the dilemma of the urban cyclist: on one hand, cycling is good for your health and the environment; on the other, cyclists are more exposed to risks such as accidents and air pollution. 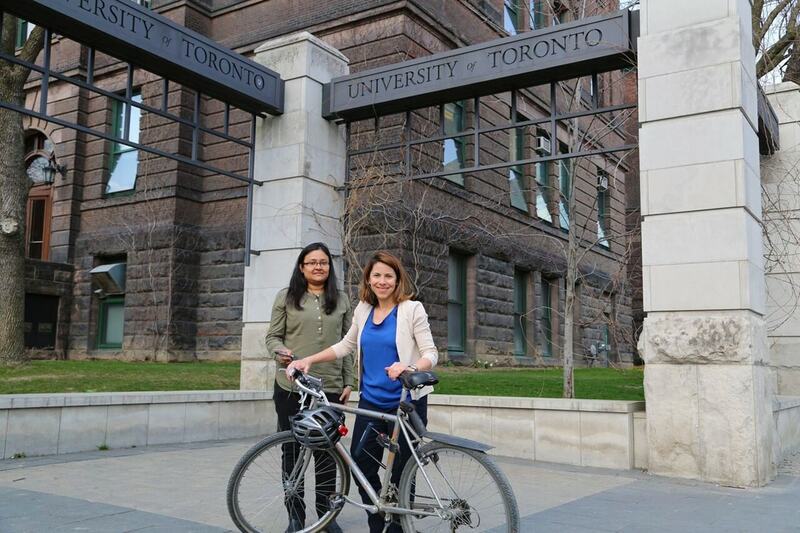 But new research from the University of Toronto is helping cyclists map cleaner routes to help minimize this exposure. Nevertheless, when it comes to air pollution, cyclists are at a disadvantage. Such pollutants include ultra-fine particles, as well as nitrogen oxides. Hatzopoulou cites studies associating increased exposure to these pollutants with respiratory problems and certain types of cancer. Her own research has shown that they can even have immediate, measurable effects on the cardiovascular system. To help address this challenge, Hatzopoulou has created a tool called the Clean Ride Mapper for both Toronto and Montreal. It is essentially a Google Map with an extra layer representing the average concentration of pollutants in a given area, as measured by her team and collaborators. Using this data, algorithms can be constructed to work out not only the shortest route between two points, but also the one that exposes the cyclist to the lowest levels of air pollution. Hatzopoulou intends to further refine the maps – for example, by incorporating real-time pollution concentrations instead of static data – but lately she has been pondering another question: are such tools actually useful to cyclists? “There are a lot of factors that influence the choice of a cycling route besides pollution,” she says. “For example, there is safety, separation from traffic, elevation, distance, etc. Sabreena Anowar, a post-doctoral researcher on Hatzopoulou’s team, is working on an answer. She’s designed a survey that proposes several different cycling routes and asks cyclists to choose which one they would prefer. By measuring which routes people would choose for either a recreational ride or a commuting ride, Anowar and Hatzopoulou hope to better understand how cyclists factor the risks of pollution into their activities. This in turn can help improve the design of tools like the interactive maps. The survey was launched in Toronto, Montreal, Orlando, Austin, New York in collaboration with researchers in those cities. It will be open at least until June, and Anowar and Hatzopoulou are hoping to get at least 3,000 participants. In addition to their own research, Anowar says that the data could also be useful for city planners. To help Hatzopoulou and Anowar in their research, complete the online survey for either a recreational ride or a commuting ride.